Axigen is an integrated email, calendaring and collaboration platform, built using a unique mail server technology, for increased speed and security. The FREE edition is intended for businesses looking for a great all-in-one alternative to open source, offering advanced mail services for 100 users (including 5 calendaring users) and a large set of available add-ons. 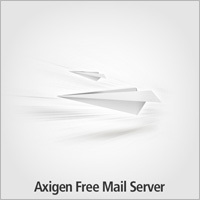 Axigen Free Mail Server is offered as a yearly license for unlimited domains. Axigen - Free email for 100 users, calendaring for 5 users included. Qweas is providing links to Axigen Free Mail Server for Windows 7.4.1 as a courtesy, and makes no representations regarding Axigen Free Mail Server for Windows or any other applications or any information related thereto. Any questions, complaints or claims regarding this application Axigen Free Mail Server for Windows 7.4.1 must be directed to the appropriate software vendor. You may click the publisher link of Axigen Free Mail Server for Windows on the top of this page to get more details about the vendor.